January holds all sorts of possibilities. Old deadlines are past and there’s time now to consider more carefully what goes on the loom rather than assuming it will be another towel run. This is a great time to revisit those weave structures that I don’t get to work on usually. Last January I sampled some Finn weave and figured double weave. That was a small project just to see if I could do it. But all through the year, a thought was niggling at the back of my mind: what if I set up the draw loom for double weave? I’ve done it before, although it’s been many years ago. Can I do it again? Double weave articles abound in Weaver’s and Handwoven. The first step for now was to review what resources I have on double weave. I have many back issues of Weaver’s and Handwoven. “Colonial Double Weave” by Madelyn Van der Hoogt in Weaver’s Issue 12 has great cross-section drawings of what the threads are actually doing and how to weave an overshot pattern as double weave. 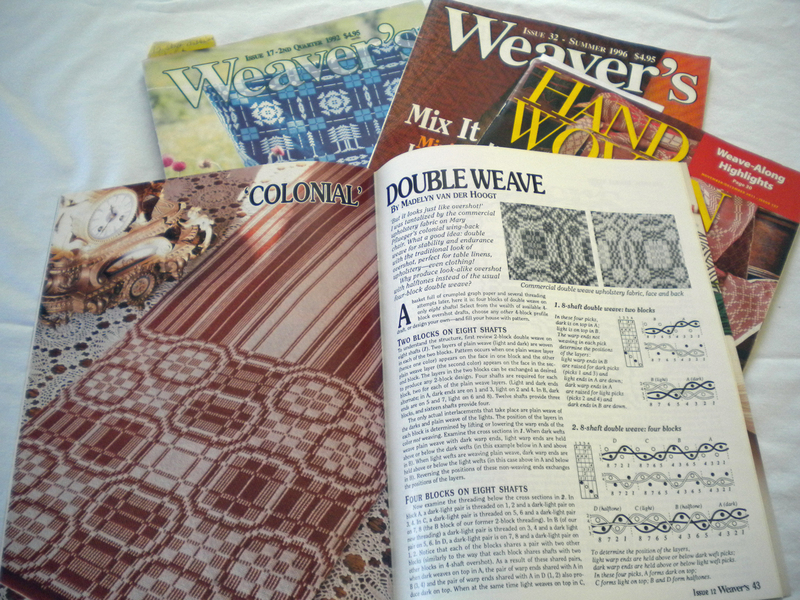 Then Weaver’s Issue 17 has several articles on double weave color and design. 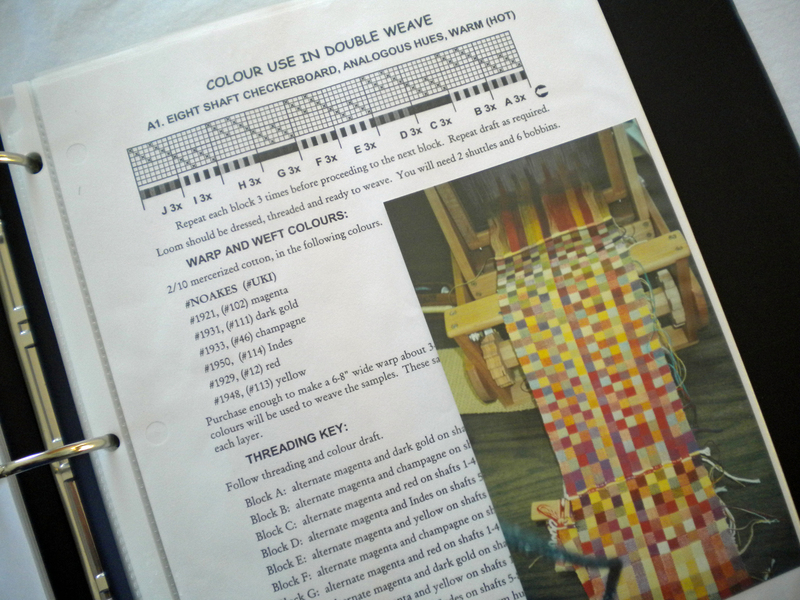 Weaver’s Issue 32 has articles by Bonnie Inouye and Doramay Keasbey on manipulating double weave drafts. And the November/December 2011 Handwoven has an article by Judith Yamamoto and Patricia Stewart on two different takes of one draft. I’ve also attended numerous workshops over the years, one of which was entirely on double weave. Ingrid Boesel visited our guild in 2002 to teach about color in double weave. My binder included photos of our round-robin projects along with the drafts. It’s fascinating to see how different colors affect the look of a fabric. Looking through these articles and studies was just the jump start I needed. 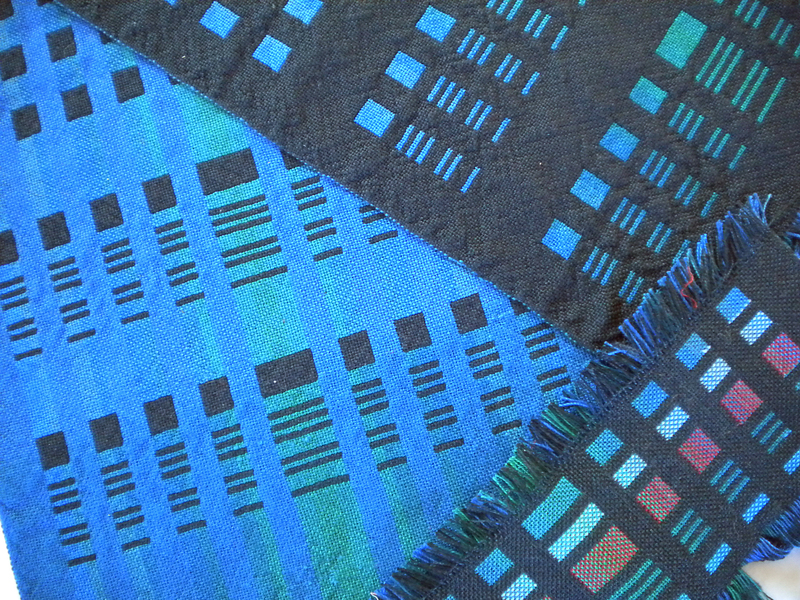 A warp of dark blue and medium blues went on my small loom to refresh my memory. I sampled a selection of weft colors, settled on one, and took off. Once I get warmed up, my plan is to expand to the draw loom. With my 20 pattern shafts, I think I can weave five pattern blocks of double weave compared to just two blocks on my 8-shaft loom. An exploration of block arrangement and manipulation is in the wings!